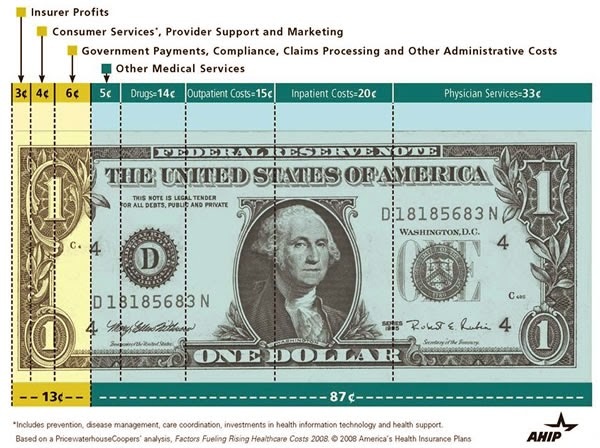 How much of our healthcare spending goes for “medical professional, physician services?” Meaning how much is paid for the services doctors provide? Depending on how you define “medical professional, physician services” it seems to range from approximately 22% to 35%. So do Physicians Get 10% or Maybe 35% of Our Healthcare Dollar? This tweet by Mary Pat Whaley sharing some info that doctors account for about 10% of healthcare spending elicited my response that it was actually closer to 30%. Then a series of tweets erupted. It became clear that we were talking apples and oranges. So per Mary Pat’s request, I'm posting some info to back up my tweet. Bottom line is that for “medical professional, physician services?” account for way more than 10% of our healthcare spending. And I’d argue that the 22-35% figures are actually higher given a physicians role in often determining when a person is admitted to Inpatient care and/or obtains other Outpatient care; both or which are broken out of the “Physician Services” buckets. 33% (2011) - "Where Does Your Health Insurance Dollar Go?" 33% (2011) - "Rethink: Where do your healthcare dollars go?" 21% (2010) - "Where do all those trillions of dollars for health care go?" 22% (2002) - "Where do health spending dollars go?" "Healthcare spending By Age Group, Family Income & Payment Source"
"What's Fueling Rising Healthcare Costs?"